Presbyopia is one of the most common vision impairments. It reduces the ability to focus on near objects. People with presbyopia often complain of headaches and eye strain, and hold objects away from their eyes in order to be able to focus on them. It is simply a result of the eye’s natural ageing, and easy to live with, as long as you have a pair of eye glasses. 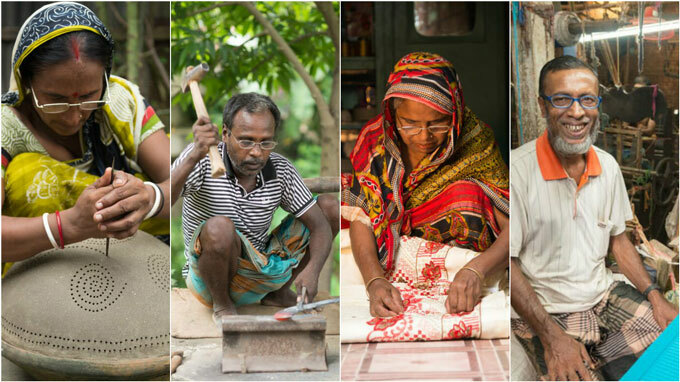 Our clients (from left): Dipani Pal, a skilled potter; Bholanath Mandal, a blacksmith; Ayesha Khatun, a craftsperson ; Nurul Amin, a weaver. In Bangladesh, nearly one-fifth of the population lives with presbyopia, but barely anyone has ever had eye glasses. That is changing rapidly though. We just hit a major milestone: 1 million people with presbyopia were identified and provided with eye glasses. What does this mean for the economy? It is estimated to already have contributed to USD 110 million in increased household income, based on an analysis of a study conducted by the University of Michigan. It takes just USD 1.8 to buy a pair of eye glasses in Bangladesh, which means that you can now buy 5 pairs of glasses for the price of one cup of coffee at Starbucks. Through a partnership between VisionSpring and BRAC, community health workers are coming to every door in the country with them. They offer free eye screenings, and have created a referral system for customers who need higher-level care for cataracts and other eye conditions. Living in the communities where they work, the female health workers reach customers in the most remote areas of Bangladesh through vision camps and home visits. For 75 per cent of clients, this is their first pair of eye glasses. For those living in poverty, eyesight means the difference between working and not working, gathering enough food or going hungry, being able to read or remaining illiterate. Vision problems have major implications on the working potential of everyone affected by them, particularly those who need to see items closely ie, cobblers, tailors, blacksmiths, and artisans. Farhadul Islam is a communication manager at BRAC’s health, nutrition and population programme.